Good things happen when a group of creative, clever women come together. The unbreakable bonds, the deep connection and the sharing that happens – SISTERLY vibes of love and appreciation. It all started with an idea. A mid-winter supper with a gathering of friends in an abandoned style building. Rustic, raw, with industrial touches. The Forge provided a perfect backdrop for this. My vision was for candle light, crisp white linens and minimal foliage, keeping a very paired back feel. Green and white – with little use of flowers. Our supper was in collaboration with my all time favourite clothing brand – TOAST. I couldn’t be more delighted that they were keen to be involved. I can’t think of a better brand to be connected with, and believe our ethos is so closely aligned. I believe that the modern ‘TOAST’ woman is also a SISTER too. TOAST provided the supper with many beautiful props, including their iconic beeswax dinner candles, spruce scented ceramic candles, sheepskin rugs and of course each SISTER had an apron each to wear. With the collaboration with TOAST and my vision for the supper, I passed the styling baton over to Hannah Bullivant to produce a beautiful space, along with the much appreciated help of florist, Erin Trezise. Hannah, arrived Friday lunch time and met myself, Erin and Silkie at her beautiful building, The Forge. Erin bought with her buckets of menthol and spruce scented greenery which we weaved into wreaths and garlands to dress the space. Our hands gently busy we chatted about the next day – all excited and eager to get started. The following morning the brilliant Xanthe arrived to document the day. Such a breath of fresh air, she breathed life into our plans, photographing every little detail for us to remember. Thank you Xanthe, for being so effortlessly wonderful in all that you do. Soon many of my SISTERS arrived to help in the set up, and 3pm arrived in a flash. Finishing a final sweep of fallen leaves before our first guests arrived. Stepping into the space were women who had travelled from all over the country. The dismal rainy day was replaced by laughter and joy as these wonderful women all settled down to workshops. 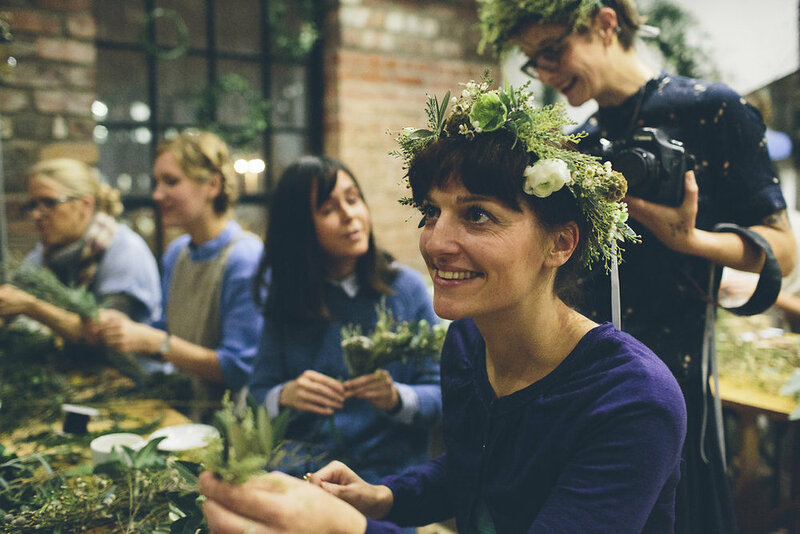 Flower Crowns by Erin, and upstairs – modern calligraphy by Lucy of Quill London. Initially strangers, laughter ensued and firm friends were being made. Stories shared and secrets told as the afternoon progressed. All helped by the gentle craft of pen and ink or the weaving of flowers. How lucky were we to have Claire Thomson to cook for us. Not only has she written a spectacular recipe book – but she has recently appeared on the Saturday Kitchen and is currently in a theatre production in London – cooking for children on stage! Claire’s three course feast was a autumnal delight, we started with a delicious spiced plum fizz cocktail, and from behind the curtain I could here the guests gasp at the taste. Soon it was time to reveal the dining area (previously hidden behind a linen curtain from view). Three courses – each a taste sensation, each one unique and full of Autumnal flavours. 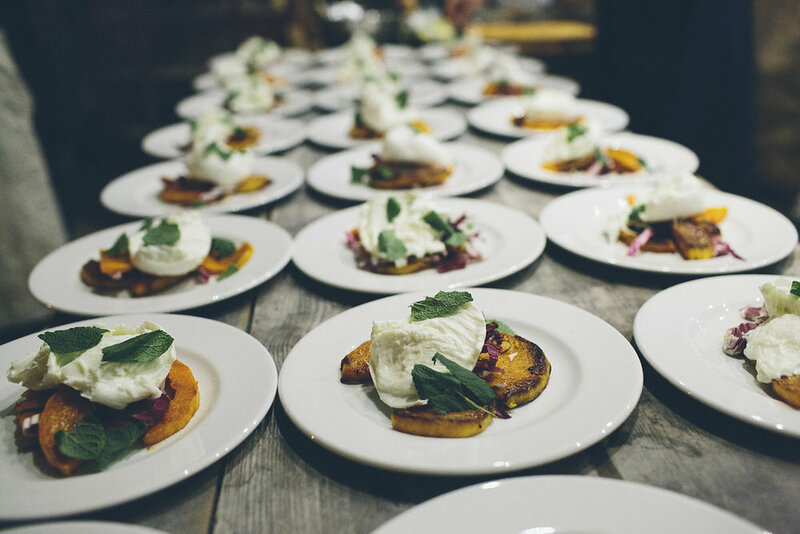 Starting with butternut squash and soft creamy buffalo mozzarella. Followed by a rich ribollita (Italian bean stew) served with foccacia bread and Italian sausage. Desert, a rich hazelnut cake with marscapone and poached pear. Magic. Sparkling. Laughter. Candle light. Delicious food. Fabulous company. SISTERS.